Stay fed, and keep your nobles happy. 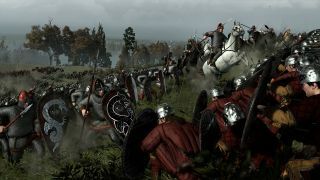 Thrones of Britannia, Total War’s first Saga spin-off, might not be as sprawling as its main series cousins, but it’s still full of complications and new wrinkles that you’ll want to wrap your head around before setting off to conquer Britain. Whether you’re planning on leading pesky Vikings on coastal raids or uniting squabbling English kingdoms with words and wars, these tips will make your reign more successful. One of the first things any king needs to do is to prepare for their inevitable death. Thrones of Britannia sees the return of mortal faction leaders, and while they can become extremely powerful generals and governors, they’re still fleshy and vulnerable. If old age doesn’t get them, then sickness, assassination or decapitation might. You will have to end up playing as the heir, so if your eldest son is a drunk dimwit, it might be time for a change. Desirable traits aren’t the only thing you need to look out for, though. If your heir is unpopular then nobles might decide to revolt the moment the heir takes over. If you can’t find anyone competent in your own family, you can always adopt a noble. But remember that adopting a large, bearded general is for life, not just for Christmas. You could do a lot worse than adding an experienced leader to your family tree, but that doesn’t mean you should be going out and getting new sons on a whim. There’s one thing in particular that’s guaranteed to make you more than a few enemies within your own kingdom: estates. When you swallow up a bunch of territory, you’ll notice once-loyal nobles spitting at you in the street, not taking your calls and conveniently forgetting to tell you about group activities. It’s not immediately apparent why, until you hit up the estates screen. When you add an area that contains an estate to your realm, it’s immediately added to your own personal collection of estates and nobles start to get jealous. You want to start handing them out to your best buds—or the ones most at risk of rescinding your invitation to their birthday party—the moment you get them. Try to keep a few for yourself, however, because they can also be given as gifts to nobles who are pissed off with you for an entirely different reason. You can directly control a leader’s development by choosing what followers they receive whenever they level up. They also develop separate traits over time with or without your input. You can influence what traits they get, however, both directly and indirectly. Generals can earn some traits immediately when you complete specific objectives—like surviving a siege or fighting when at over 50 years of age. You can encourage other traits gradually over time. If you’ve got a governor who you wish was a little sharper, for instance, you might want to build a library in the province they’re running. You can also find them a wife, whose traits then affect the leader. That’s more risky, though. It costs money to find a wife in medieval Britain, it seems, whether it’s for the faction leader or a random noble. Also, beware: not all traits are positive. Marching up and down Britain with occasional breaks for bloody and gruelling battles burns a lot of calories, so armies need to be well-fed. At first, you’ll be limited to a single army thanks to low food, but you’ll have enough money to build and upgrade some farms, allowing you to expand your forces in a few turns. Resource buildings like farms and mines are no longer constructed inside settlements and are instead represented by small villages that don’t have any garrisons. This makes them a lot more vulnerable to attack, and it also means you don’t have to besiege a settlement if you only want more farmland. Once you’ve upgraded your own farms, then you start looking for ones to pinch. Shields are still incredibly important in Thrones of Britannia. This is the age of the shield wall in Britain, where warriors snuggle up close together behind a wall of wood and metal, waiting for screaming horses and men to smash into them. Every unit has a role, but it’s the shield-bearing infantry that are in the spotlight this time. Plenty of shields means that you can dig in and make a mini-fortress out of men; one that can handle even terrifying cavalry charges. While most infantry units have shields, the size and accompanying weapon matter. Spearmen can make squares, giving them more defence against cavalry, while elite swordsmen can make shield castles to shrug off even more arrows. After a break from them in Warhammer, manual naval battles are back in Thrones of Britannia, and they are still best avoided. This is tricky however, because Vikings are quite fond of attacking from the high seas. Most warriors aren’t experienced seafarers, so whenever they’re on the water, they’re seasick, making them rubbish in a scrap. Vikings have stronger stomachs, however, giving them a distinct advantage at sea. They love hunting down boats and going on raids, so you’ll inevitably be thrust into a sea battle. They’re ponderous and messy, so my advice is to just auto-resolve them. If you’re playing as a less nautical faction, that means you might have to swallow extra losses, but it’s a small price to pay for staying dry.